Katherine Johnson is the mathematical genius who helped make the historic Apollo 11 moon landings possible and made sure that Apollo 13 returned home safely when the mission was in critical danger. As a child, Katherine loved to count. She counted the steps on the road, the number of dishes and spoons she washed in the kitchen sink, everything! Boundless, curious, and excited by calculations, young Katherine longed to know as much as she could about maths, about the universe . . . Helaine Becker interviewed Katherine and her family for this authorized biography. 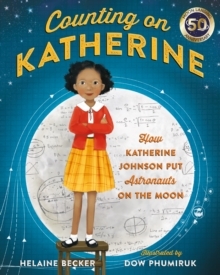 From Katherine's early beginnings as a gifted student to her heroic accomplishments as a prominent mathematician at NASA, this is the true story of a groundbreaking African-American woman who went above and beyond what was expected of her in the 1960s, saving lives and making enormous contributions to history. Featuring Dow Phumiruk's gorgeous full-colour illustrations throughout.